Growing up, I was a shower freak and would be one of those annoying people that come out with the (much overused) line about not wanting to soak in my own dirt. Nowadays? I’m a bathing convert. In the Summer, it’s still a rare occurence… but now the nights are becoming cooler, I can appreciate the enjoyment that wallowing for an indecently long period of time in a tub of hot water brings. Especially if I lock the bathroom door first so no-one tries to come in for a crap and ruin my zen. I don’t know about you but… for me, part of the enjoyment of bathing is the whole ritual that sits alongside. And a true simple pleasure is using a new bath oil/ballistic/melt/whatever for the first time. I always love the idea of lighting candles but mostly am a bit slovenly for all that. My latest indulgence (and at £18 it is a little bit of an indulgence) is my India Hicks Island Night Milky Bath from Crabtree & Evelyn. India Hicks is the designer grand-daughter of the late Earl Louis Mountbatten, who is well known round these here parts and buried just up the road. I don’t know why that’s relevant… it’s really not…I’m doing that bloody automatic writing again. I use just a capful and it fragrances the water nicely. It’s a tropical scent… but not like I’ve just poured a can of Lilt in the tub. It’s soft and delicate… like I’m bathing with my window open and the scent of jasmine is being carried in on a warm breeze. Slap me, I’m sounding pretentious. But that’s the only way I can describe it. It’s not a BIG floral, it’s just evocative. It leaves my skin feeling soft (but not soft enough to forego moisturiser) and Mr. L says that he can still smell it on my skin when I use an unscented moisturiser afterward. At £18 for 250ml, I’d quite like it to clean the bath and re-grout the tiles too but it makes for a lovely ‘special’ treat when the day has been a little too much to bear. 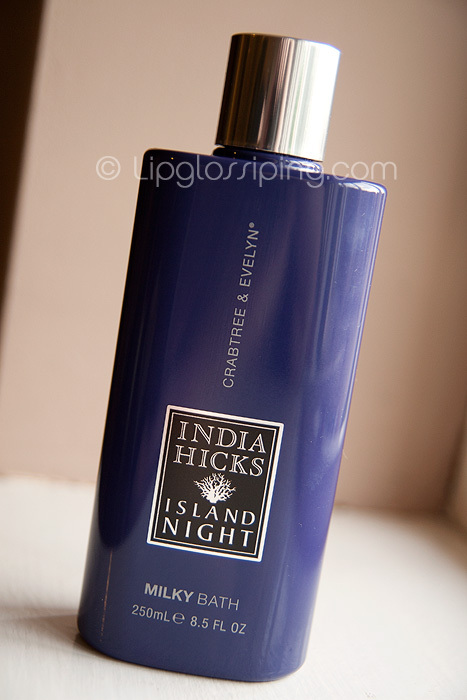 India Hicks Island Night Milky Bath is priced at £18 and available online and instore at Crabtree & Evelyn. What are your favourite bath-time indulgences? Most of my posts start out as automatic writing and then I have to have a word with myself and remind myself that not everyone wants to know the inner workings of such a great mind (ha!) so I’m forced to edit it up a bit. And I totally get you on the having a soak thing. Thankfully, I’ve never had to fight anyone to have a soak..when I was younger and our house was smaller, I had no stresses to wash away, my parents moved into a much bigger house just when I started uni so when I wanted a soak and was at home, there were enough bathrooms to be used if anyone wanted a crap or shave..or a crave..which I think would be difficult, how can you shave sitting down? Well, I’d prefer that to someone standing up shaving and shitting all over the floor. Anyway, boys never want a soak so I never have to fight with Simon to have a soak in the bath so I’ve pretty much got that sorted. I love the Molton Brown soaks, their smell really relaxes me. Lol, glad it’s not just me that fights for the bathroom. I’ve the added joy of the dog being fascinated by anything bathroomy; always makes hair dye sessions interesting! I’ve always wondered about this fragrance-it sounds divine! I will definitely try this-but do they have a shower gel too? I’m still a shower girl!